Strategic Industries was founded in 1999 by Douglas Barnes with the vision of providing integrated pest management and food safety services to the highly regulated food, pharmaceutical and healthcare industries in Georgia. At that time, and already having 18 years of commercial pest management experience with 02 national companies, Douglas knew of the frustrations felt by the clients in the highly regulated industries and sought to address them. 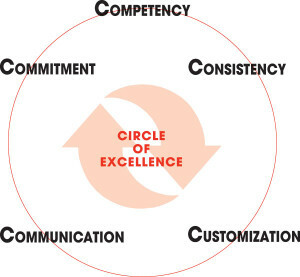 Our Circle of Excellence, and the 5 C’s listed below, is our framework. Strategic Industries has achieved unparalleled levels of service quality and client retention by providing customized and guaranteed solutions to highly regulated, detailed and sensitive commercial clients. Strategic Industries is a trusted service provider and partner to many of the largest and most recognizable companies in the world. We deliver brand protection with competency and commitment. At Strategic Industries, we are committed to being your trusted pest management provider and offer comprehensive commercial programs that will reduce risk, protect property, health and the environment. Strategic Industries offers each client customized solutions to meet their communication and documentation requirements. Solutions available include digital web based and electronic reports, email notifications and onsite written reports. When you partner with Strategic Industries in the commercial marketplace, our teams will create a relationship that evolves into a true strategic partnership. Strategic Industries is a premier pest management company whose sole purpose is to provide consistent, quality pest solutions to businesses throughout the Southeast.